Anyone who has experienced a major storm must have had at least one moment when they wondered if the great forces that brought life on our planet had suddenly turned and threatened to extinguish it. Few things in our existence can trigger such a profound sense of peril as one’s world being turned upside down by a major storm. Yet, even though this response is hard-wired (via evolution, of course) and provokes our keenest sense of dread, we seem to quickly forget this terror once it passes and carry on heedless of the future. But this is how Trump and climate deniers are responding to Climate Change. They toss a snowball into the Senate chambers (supposedly proving it cannot be warming if we can still make snowballs) and rail about how the liberals are trying to take over the country by increasing government to address this ‘hoax’. Parents often respond immediately to an unseen growth in their child’s brain with denial but quickly come to their senses knowing that every minute counts. We too must get over our disinclination to put off future threats and deal with them on a scale and time frame that will matter. 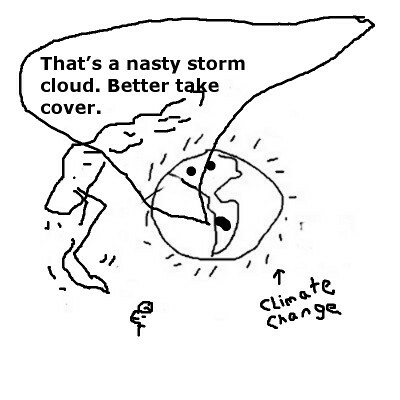 The melting of the ice and permafrost in the Arctic and the glaciers calving in the Antarctic are an indication of an unstoppable catastrophe unless dealt with immediately, just like a cancer. 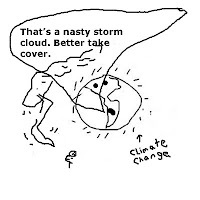 That all-shaking thunder of a storm should remind us of that we have the power now to help our children adapt and maybe lessen the consequences of Climate Change.